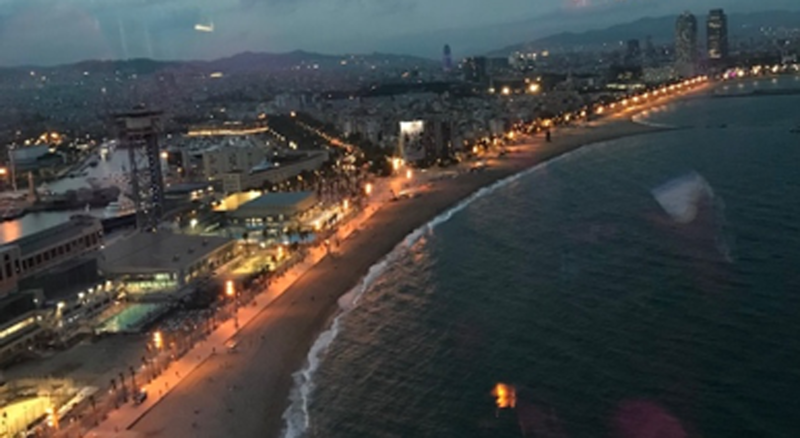 Due to the Erasmus+ program I was able to spend one semester in one of the most fascinating cities in the world – Barcelona! Catalunya was my top favorite city to experience a semester abroad and I was happy to fulfill this dream there! The faculty of education in Barcelona is not located in the city center, much better – it is located in a very calm and nice neighborhood called Horta, which is in the north of Barcelona and not far from the center, surrounded by beautiful nature and closely to one of the most beautiful parks there. The faculty consist of different buildings, such as the faculty of education and the faculty of psychology. Still, the faculties are not that big you won’t have troubles to find your way! And if you do, staff and also students are very kind, if you need help – there are a lot of Service-Desks in almost every building. The metro station and the busses are very close and easy to reach. Since I had a full timetable, I was not able to take Spanish nor Catalan courses, but the university offers a lot of language courses. The teachers are very welcoming, and the mentors take time to have an overlook at the courses you want to take and support you in any way they can. It is mostly possible to participate in all courses, since a lot of courses are in English. The timetables are a little bit different, every course takes place two times for two hours every week. The enrollment took longer than normally, but don’t worry – you are in Barcelona, they are just more relaxed! If you want, you can get a university ID card for free. You don’t have any advantages, but it is still a very nice memory to have! I went to Barcelona in my 7th semester and I still had to do one of my practicums. The practicum in the winter term is only for Erasmus students, which is a very good opportunity to have! The practicum takes place two times a week, normally from 9am to 5pm. The education system is completely different than back home. Students have a break from 1pm to 3pm, and so do you! The teaching practice is a once in a lifetime chance – to be able to experience and observe a different school system in a different country is especially for teachers to be an enormously important experience! Meetings with our mentor and the other Erasmus students, who were doing their practicum was a very nice experience. There, we were able to talk about our experiences and share differences we were able to observe. I was so lucky – I spent my practicum in a school I felt comfortable from day one! The whole staff welcomed me as we would have known each other for years. The children are very fascinated about you! The best part is, even though their English might not be the best, they still try to communicate with you by showing pictures or just showing their affection by the uncountable hugs and smiles you get every day! After only two months of being a part of their community, it is so nice to see how much they have learned and what they are capable of! As you are doing an Erasmus program and you are going to find a lot of new friends from all around the world, traveling and exploring the country and the culture is a big part of your unique experience! First of all, flights are way cheaper than you might expect! I took the chance and traveled to the north of Spain and spent 3 wonderful days in Bilbao and other small cities. Me and my Erasmus friends rented a car and did a road trip – an experience I will never forget! I was able to see the beauty of isolated coasts and beaches, just breathtaking! Because this trip was so good, I decided to fly to Malaga for 4 days with 5 other girls and traveled through the south of Spain! Since it was already autumn, there were not that much tourists and the perfect autumn weather to have long walks and relaxed drinks! At the beginning of December, I traveled to Lisbon and spent another 3 days – even if it’s not Spain – an consider going there and make your friends back home jealous, because you are sitting on the coast, sipping local wine at 18 degrees in December! Even if you decide to stay in Barcelona, there are nice day trips you can easily reach by train, like Granada, Sitges or Tarragona! What might be shocking to you are the prices to rent a shared flat room! You should have a look at different Facebook pages in order to get a nice room in a well located flat. But be careful – there are a lot of deceitful offers! You could use Apps like Badi or book a room over a trustworthy website called “spot a home” – I booked my room there and everything was fine! I would also recommend searching for a flat with more than just one roommate – it is just easier to get in contact with a lot of different people! I decided to pay more than the average prices, which are already high – but to life in a save and nice neighborhood, which in my case was Gracia! Food in general is the same or even cheaper than in Austria and a coffee with milk and croissant is only about 2€! The metro ticket, especially the T-Jove ticket is worth every penny! It lasts for 3 months and you can use all public transport systems – metro, bus, tram and the train up to a certain point! There is a lot to see – if you inform yourself before you will find out that a lot of sights are free on certain days. That includes La Sagrada Familia or Park Guell! A tip to safe money but not to miss out something! Another very important tip – Barcelona is a very safe city, still there are a lot of pick-pockets! Be careful with your things! Do not have too much money with you or your credit/debit card in your backpack – just to be safe in famous sights and on the streets, as well as in bars or restaurants, always double check and always have your eyes on your things! However, I am very happy and glad that I was able to experience the real Barcelona, the beautiful weather, the nice local people and just absorb the positive energy!